A German magazine for the CPC and PCW. You can find all the scanned issues, along with the dsk files, in the CPCWiki Forum's downloads section. Caution: The 1985 issues are uploaded as jpg's on cpcwiki - but, unfortunately with mis-numbered filenames (eg. page 64 stored in filename62.jpg), see here CPC Schneider International, 1985. The CPC Schneider International originally aimed at the semi-professional CPC user. It contained market news, game and software tests, hardware modification tips (8th printer bit, CP/M switch, and similar), software listings and much more. In late issues there were even reviews of scene demos. 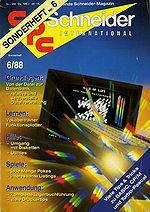 The first rename took place after Schneider started to sell the PCW/Joyce and PC-1512/PC-1640 computers in Germany. 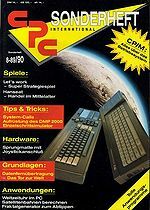 The CPC Schneider International was renamed to "PC Schneider International" (with "CPC" written vertically inside the "P" in PC, which was going to last until they should rename to CPC again) to reflect the fact that it also covered the PCW/PC models. The second and third rename happened after Schneider Computer Division stopped distributing the CPC computers in Germany, and Amstrad stepped in. The magazine was named "PC Amstrad/Schneider International" for a short time and to "PC Amstrad International" later. 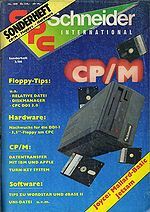 As of 10/1991, the publisher decided to drop the PC section and concentrate on the CPCs and PCWs/Joyces only, so the magazine was renamed a fourth and last time: "CPC Amstrad International". 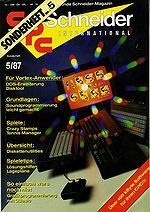 The magazine started in 03/1985 as CPC Schneider International. 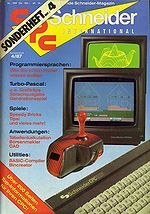 Schneider because the Amstrad CPCs were sold as Schneider CPCs in Germany and International because the magazine had contacts to other publishers abroad. The early years also were the best in the magazine's lifetime: The CPC was selling quite well in Germany and as the magazine lived from readers participating (all listings printed were sent in by readers before) there was enough content to print. The hardware and software test sections were well supported by the hardware vendors and software distributors and there were enough advertisers to ensure the magazine earned money. 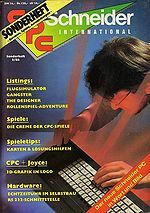 The magazine was renamed to PC Schneider International to reflect the additional PC coverage inside. The PC coverage was limited to the Schneider PC-1512/PC-1640 models (and their matching portables) as well as the PCW/Joyce. The editors were concentrating on the features unique to the Amstrad PCs, e.g. the included GEM and DOS plus. At this time, the CPCs and the magazine were still going strong. 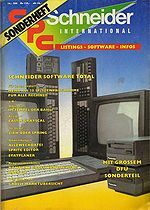 To reflect the changeover from Schneider to Amstrad, the magazine was renamed to PC Amstrad/Schneider International first and PC Amstrad International later. The history behind this was that in 1988, Schneider Computer Division dropped the distribution of all Amstrad computers in Germany, and Amstrad opened a German branch. Sadly Amstrad couldn't keep the change seamless: After about half a year, the supply in Germany was interrupted and the shops went out of stock. This was less of a problem if you already owned a CPC, because the supply with games was widely not depending on Schneider/Amstrad and furthermore, many add-ons were imported by the shops themselves. However, original Amstrad parts like the CPCs themselves, monitors, disk drives and so on became harder to get. 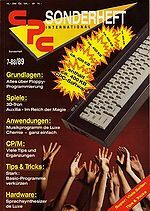 As at about the same time new, more powerful home computers like the Amiga and Atari ST were announced or even became available, this was the beginning of the end for the CPC in Germany. The magazine was renamed "back" to CPC Amstrad International again. In order to keep the magazine up, DMV tried a lot of things. For example, the printing technology was changed to a cheaper one (two colours instead of four), the magazine no longer appeared monthly but only every second month and as last resort, they no longer sold it at every newsstand but only at railway station bookstores and via subscription in order to reduce the amount of magazines returned. With the PC-1512 and PC-1640 becoming more and more outdated and more and more magazines coming up covering PCs only, the editors decided to drop the PC section in favor of the CPC/PCW again. This page was last modified on 1 November 2015, at 11:07.